Posted on June 4, 2015 June 4, 2015 by Mark R.
Hello all! I need your help with a new series highlighting the ships piloted by Eve’s explorers. I’ve been playing Eve Online for a little over 100 days and in that short time, I’ve come to realize that my fellow Explorers are a diverse and intriguing bunch. Some are newbies just starting-out on their journey through The Cluster. Others are hardened veterans who have been doing this sort of thing for years. Still others are notorious PvP pirates who, for one reason or another, decided to put away the black flags and try something new. There is also great diversity in how Explorers choose to explore. There are Explorers who specialize in running sites (and subsets of sites), Explorers who run missions, Explorers who spend almost all their time in wormhole space, and even Explorers who are perfectly content just cruising around the galaxy in search of whatever might catch their eye. Despite such diversity, there are some characteristics that seem to unite almost all Explorers. In general, I’ve discovered that they are typically intelligent, thoughtful, and curious. They also tend to be (understandably) cloaky and sometimes go for days/weeks/months without ever encountering one of their counterparts. While membership in an explorer-centered corp like Signal Cartel can help bridge those gaps and provide a forum for inter-Explorer engagement, to truly tap into all that collective knowledge often means being logged in at the right time…and for the right amount of time. It also requires having the courage to ask questions and that’s not always easy; especially for a new player. I can sympathize. I’m a neurotic perfectionist and not knowing the right answers or being otherwise incapable is generally an uncomfortable state for me to be in. Of course, that’s not a realistic mindset. No one is born with all the answers and all knowledge, even so-called original and organic knowledge, requires the exchange of some information from one individual to another. 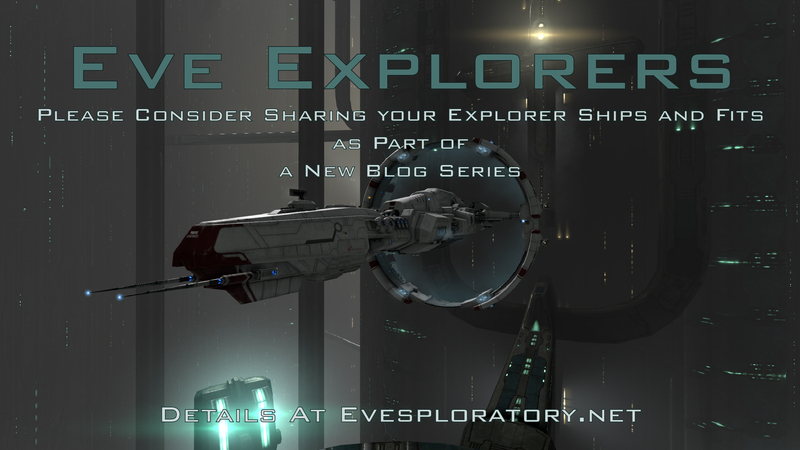 So, in that line of thinking, I wanted to start a series highlighting a topic that I believe many of my fellow Explorers are curious about, but don’t always ask about…or don’t always happen to be logged-in to chat when this topic is covered: Explorer ships and fits. Now, the aim of this series is not about optimal ships and fits. It is a series about your ships and fits. What do you pilot, how do you choose to outfit it, and why? What’s the story behind your ship? What is its name? This will be a series focused as much on the pilot as the ship that is piloted. Think of it like a car show…or air show…in space. Explorers from all walks of life and of all experience-levels will have a chance to learn about and share different ships and different approaches to exploration and I bet we will all discover some things we hadn’t thought about. I’m also hoping that it will provide a collection of ships/fits that newbies can refer to for inspiration and to help them come into their own exploratory stride. Also, I want to emphasize that this will be a friendly and no-pressure environment. Who cares if you decide to fly a certain ship or fit it a certain way if it works for you…seriously. If you love flying your uncloaked Algos into wormholes while shouting “damn the torpedoes!”, then all the power to you. I may find that choice a bit stressful, but it’s your ship and my goal here is to show how Explorer ship diversity reflects the diversity and individuality of their pilots. If it works for you and your objectives in Eve, then I’d love for you to share it here. Pilots of all experience levels welcome as long as you’re honest, friendly, and open to sharing a little about yourself and your ship. So, if you’re interested, please get in touch via Twitter @markusvulpine or by contacting me in the Comments section below. You can also send me an EveMail (character name: Markus Vulpine). Once I hear from you, I’ll get in touch with details on my proposed format. Thanks for reading and I look forward to your input! To kick things off and break the ice, I’ll be highlighting my own ship shortly, a Stratios “sailing” under the name Urocyon. Welcome to game 🙂 Glad you’re enjoying the game (based on your blog posts so far). It hooked me in no time. You should consider joining us in the community on Twitter as well.